Welcome to Urban People. A fresh perspective on urban culture, spun by all the creatives breaking the mould and making it happen. The Double Rainbouu website describes its sun-drenched, beach-life-or-nothing muses as “sun drug seekers” and “pink moon walkers” in search of “fast paradise” or a “free beach rave”. There’s something undeniably Sydney about Double Rainbouu. 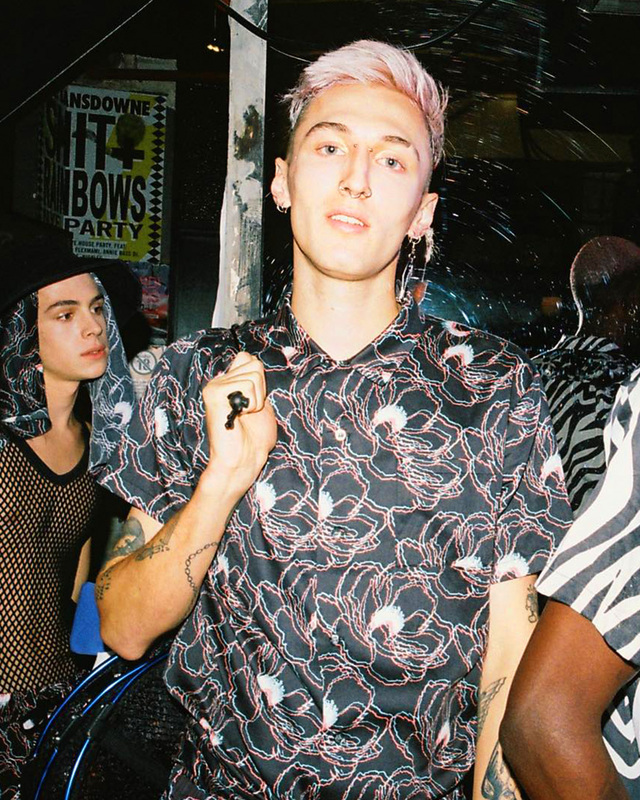 Led by local guys and former Ksubi designers, Mikey Nolan and Toby Jones, this beach-inspired fashion label has made one hell of a splash reinventing the humble button-up Hawaiian shirt. Where others might have surfaced predictable prints of pineapples, lobsters, turtles and other ho-hum summer iconography, Double Rainbouu is totally fresh—made for the salty swell at Bondi and the skatepark, for sundowner Negronis oceanside, late nights and pasta in Potts Point, art parties and pub gigs in Newtown and everywhere else in between. 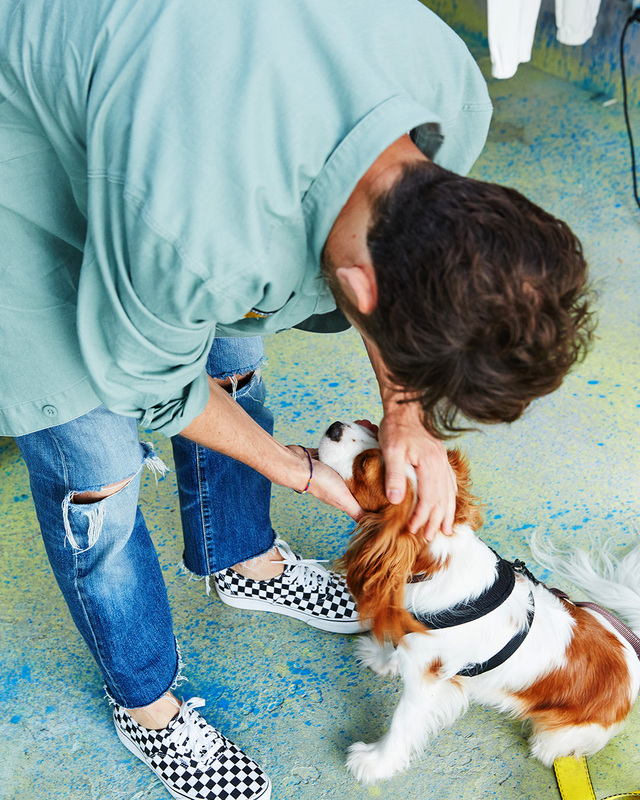 As well as their unisex Hawaiian shirts, swimwear, sunnies and beachy cover-ups, the line includes tracksuit sets, shearling slides, caps, tees, skate socks, bum bags and a sneaker collab with Globe—a brilliant and bright mashup of beach and streetwear that encapsulates what life and leisure in Sydney is really all about. Mikey Nolan and Toby Jones at the Double Rainbouu Guerrilla Store at Bondi Beach. Since their launch in 2016, they’ve scooped up plenty of style accolades and their punchy, electric prints are now stocked at high-end retail heavyweights like Net-A-Porter, Opening Ceremony and Lane Crawford. Even with the world calling, Sydney’s still home for Double Rainbouu. We spent a day in the salty, sunny city with the guys and found out where it all began and where they hang. So what's the story of Double Rainbouu. How'd you dream it all up? We were looking for a niche idea to do, still in fashion. A simple concept and one that was print driven, as that’s where our strengths lie. We were on a research trip to Bangkok and were buying heaps of Hawaiian shirts but there was always something a little off about them. We’d always liked Hawaiian shirts since Baz Luhrman’s Romeo and Juliet and we thought why not do a label of just Hawaiian shirts. Nobody was doing it in a fresh way and it seemed random enough to catch people’s eye. You're both Sydneysiders. How does the city influence you on the day-to-day? I think the brand is very Sydney or very coastal Australian in general in the way it incorporates beach wear into everyday wear. Europeans will design a swim short to wear by the pool for an hour and then you change back into a walk short when you leave. We design ours more like a swim meets walk short. So you can wear them all day and if the chance of a swim happens you’re good to go. It also makes sense doing beachwear from here because we live and breathe it. What's your ideal summer Saturday in Sydney? It'd look like beach, lunch, beach, bar, dinner, bed. At the Double Rainbouu Guerilla Store at Bondi Beach. Fratelli Paradiso is our all-time favourite restaurant in the world—it’s just so consistently good. For breakfast, lunch or dinner. It has a local neighbourhood restaurant feel and a buzz about it at the same time. The service is also second to none and everything that is so beautiful about the guys who own it is infused into everything about the place. 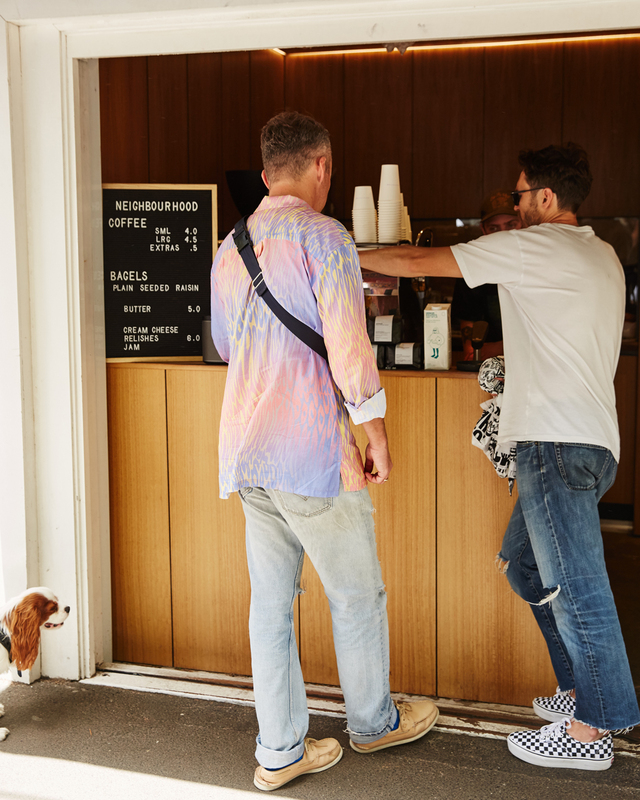 Neighbourhood in Surry Hills is our local office coffee shop. Charlie, the barista there is a legend. We love him. Always good for an actual conversation, plays good music and obviously makes very good coffee amongst his many talents. We like to shop at Incu, Acne and Somedays for menswear. Double Rainbouu's Sun Children blue Hawaiian shirt. Favourite beaches are Collaroy Basin, Chinamans beach, Castle Rock beach and Paradise beach near Clareville on Pittwater. They’re all good, no wave beaches we like. Bungan and Whaley are our favourite ocean beaches. 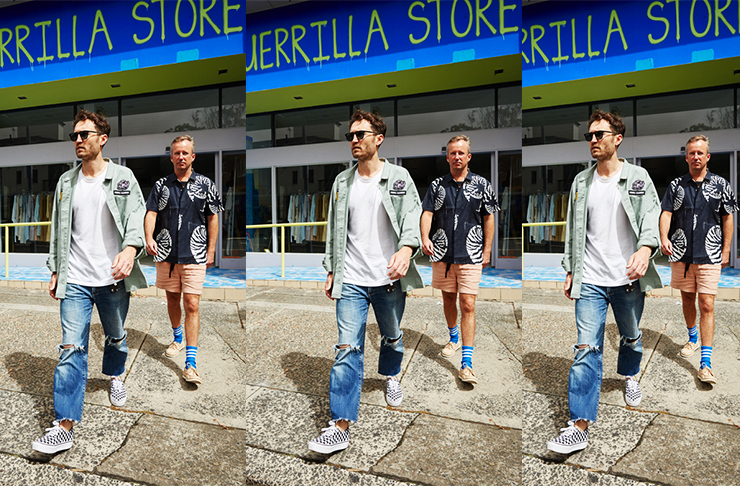 Shop all the Double Rainbouu goodness at their summer Guerrilla pop-up at Bondi Beach, details here. Image credit: James Adams and Double Rainbouu.